2. How does a Constant Current Sink Work ? Actually, what is depicted on the drawing looks more like a sink, a drain to me, like as sinking, draining, or “flushing to Ground”, rather than “sourcing from the High Voltage supply”. For the sake of a brief discussion, assume R1 = 70R. R2=200K. So, to solve this riddle, you only need one piece of information: the voltage drop on a conducting base-emitter diode is ~ 0,7Volts (more or less). Let us assume, that both of the transistors are conducting slightly. The Collector of T2 is the stable “current drain”. R2 is a huge resistance, that supplies a polarization voltage for the base of T2, from a high voltage source. d). The collector of T2 is the the point that we use as a constant current sink (drain). But WHY does it sink a constant current ? I will prove to you that it is constant, because … it is impossible for this current to change. e). Assume: for some unknown reason, the T2 collector current increases. This would imply that the R1 current increases. This would imply that the voltage on R1 increases. BUT …. this is not possible, as even a tiny voltage increase on the base of T1 shall cause it to massively conduct. This would imply that the voltage of it’s collector is massively pulled DOWN, due to the low resistance path via T1 to ground, in comparison to a huge value of R2. But … this voltage will be pulled down only a little tiny bit. Why? Because the collector of T1 is connected to the base of T2. Even a small decrease of the voltage on the base of T2 shall result i T2 conducting LESS. The collector current of T2 returns to the point of equilibrium, i.e. to our 10mA. Then, T1 also returns to it’s state of equilibrium. The huge gain of both T1 and T2 is used solely for this purpose, of “returning to equilibrium”. f). Contrary to the above, lets assume: for some unknown reason, the T2 collector current decreases. This would imply that the R1 current decreases. This would imply that the voltage on R1 decreases. BUT …. this is not possible, as even a tiny voltage decrease on the base of T1 shall cause it to decrease it’s conduction. This would imply that the voltage on it’s collector rockets sky high, due to the high voltage supplied via R2. But this will not happen. Why ? Since the collector of T1 is connected to the base of T2, and a minimal rise of the voltage on the base of T2 shall imply that it conducts MORE. The base emitter diode of T2 will conduct stronger, and T2 will open up, allowing a greater flow of current from the collector of T2 through R1. The current flowing through R1 returns to the point of equilibrium, i.e. to our 10mA. This also implies that T1 also returns to it’s point of equilibrium. The huge gain of both T1 and T2 is used solely for this purpose, of “returning to equilibrium”. For examples sake: Assume a voltage supply of 30 Volts. 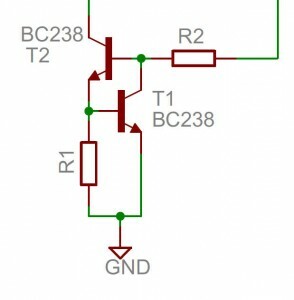 Assume a resistor of a value of 2kohm, connected to that supply from its top, whereas its bottom end is connected to the CCS (collector of T2). Since the current MUST be 10mA, that means a voltage drop on this resistor is equal 20V. The collector of the transistor T2 is elevated 30-20 =10V above ground. Now, a different example: Assume all as above, but a different resistor, say 0,5kohm. Since the current MUST be 10mA, that means a voltage drop on this resistor is equal 5V. 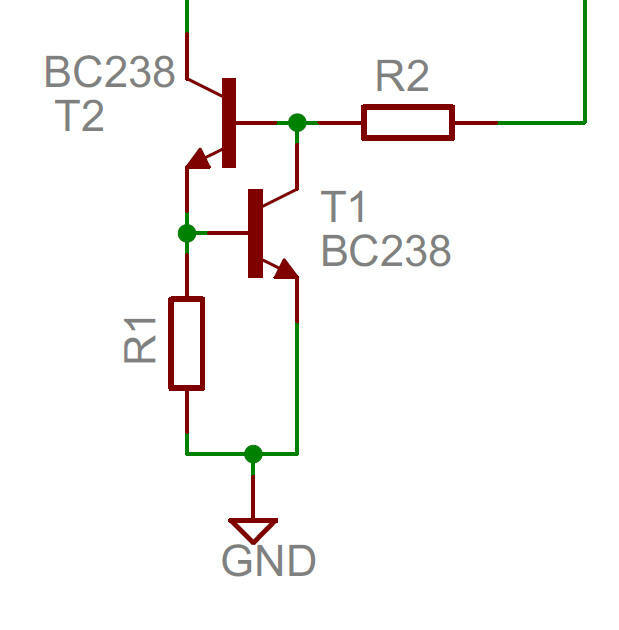 The collector of the transistor T2 is elevated 30-5 =25V above ground. Obviously, If the resistor is ZERO ohm, the current will STILL be 10mA. But the potential of the collector of T2 will be equal to the maximum 30V (power supply voltage).